WeObserve will launch its first three Communities of Practice! This will take place on 6 June 2018 at the University of Geneva, during dedicated sessions on the Citizen Science Workshop Day of the 2nd International ECSA Conference. The WeObserve CoPs will serve as the vehicle for sharing information and knowledge on selected key thematic topics related to Citizen Observatories (COs), strengthening the knowledge base about COs in order to move citizen science into the mainstream of environmental management and decision making. Don’t miss out on this exciting opportunity to engage with a wide range of stakeholders on the consolidation of knowledge in the field of citizen science and COs! In total, WeObserve will develop five CoPs over the course of the project. Each CoP will receive support and tools for managing the CoP activities (online and F2F) and undertaking dissemination and outreach. The CoPs will exist for as long as they provide value to their members, with WeObserve support to draw on for the coming 2 ½ years. Detailed Terms of Reference for the WeObserve CoPs are available here. 3) Interoperability and standards for citizen observatories – adopting data quality, curation and preservation of citizen-science data, and addressing privacy and licensing for CO sustainability (led by CREAF). Are you already involved in citizen science and citizen observatory initiatives or CS working groups? Are you keen to exchange experiences with like-minded CS enthusiasts? Then we would like you to participate in the CoP whose topic you are an expert in! The CoPs are intended as a key mechanism to consolidate knowledge on COs inside as well as beyond the WeObserve consortium. 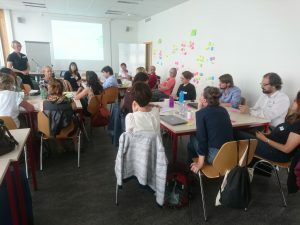 As such, a wide range of stakeholders is invited to take part in the CoPs, such as public authorities (local, regional, national, EU), civil society organisations, research and academia, citizens and citizen science working groups. Activities that the CoPs will undertake include thematic knowledge co-creation, generating new solutions or agreeing on how to use existing ones, and knowledge sharing activities (meetings, events, conferences). Not yet convinced that the CoPs are interesting enough to join? Don’t miss this opportunity to consolidate knowledge in the field of citizen science and COs with a diverse set of stakeholders! We hope to see you in Geneva! You can register for the launch workshop of the CoPs here.